Presentation Pilot Pro is the ideal wireless presentation remote for presenters who use Microsoft PowerPoint or Apple Keynote presentation software. 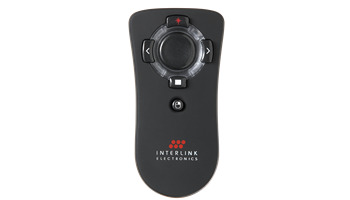 Pilot Pro features slide control and slide hiding buttons, laser pointing, complete mouse control and a USB receiver you can store right inside the remote. A 50-foot RF wireless range gives you the freedom to interact with your audience. There's no complicated setup or software to install, just plug in the USB receiver and start presenting.